George’s obituary is the second one that appears on my blog today. Earlier, I posted the obit of my paternal grandmother Julie (Vanasse) Belair. George and Julie were the younger children of Olivier Vanasse and his wife (and first cousin) Elisabeth Vanasse. George, the eldest son, was born on 13 October 1891. He and his siblings – Mary, William, Cecilia, Joseph, Corinne, David and Agnes – grew up on their parents’ farm on Ile des Allumettes, Pontiac County, Quebec. In June 1920, George married (Marie) Louise Potvin in her hometown of Bourget, Russell County, Ontario. 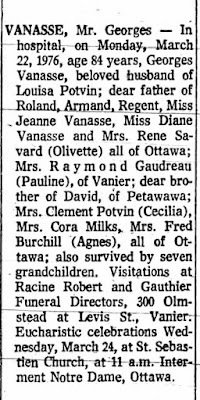 They and their seven children (three sons and four daughters) lived most of their lives in Canada’s capital city, Ottawa. I don’t believe I ever met my great-uncle George, but I had the opportunity to visit his eldest child Jeanne (Jean) at her home in the 1980s, while on vacation in Ottawa. 1. 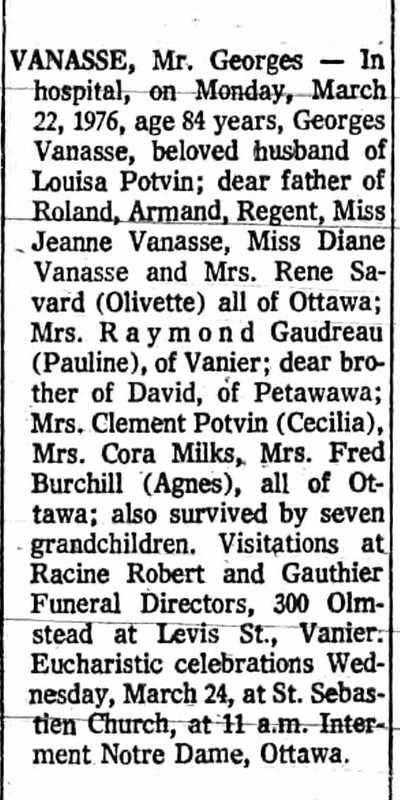 “Ontario, Canada, The Ottawa Journal (Birth, Marriage and Death Notices), 1885-1980”, digital images, Ancestry.ca (http://www.ancestry.ca : accessed 2 July 2013), Georges Vanasse [sic] death notice; citing The Ottawa Journal, 23 March 1976, p. 36, col. 7; City of Ottawa Archive, Ottawa, Ontario, Canada; database created from microfilm copies of the newspaper.